NASHVILLE, Tenn. (CNS) — As a lieutenant colonel in the Tennessee Army National Guard, Deacon John Krenson was responsible for the well-being of his soldiers in many tense situations in Afghanistan and Iraq. Now, on the cusp of retirement from the guard, he is serving soldiers in a new way, as executive director of Operation Stand Down Tennessee, a unique local nonprofit organization that offers a wide range of services to honorably discharged veterans and their families. When the position with Operation Stand Down became available last spring, Deacon Krenson saw it as “an opportunity that I couldn’t ignore.” Deacon Krenson, who serves at Christ the King Church in Nashville, said the position “fused together everything that my life has been about,” providing the perfect synthesis for his experience in the military, the diaconate, and the business world. The husband and father of two teenagers oversees its network of services designed to help veterans after they return from war, bearing wounds both visible and invisible. Operation Stand Down serves veterans from all backgrounds, with a particular focus on those who are homeless or failing to thrive because of addiction, physical or behavioral issues. Discharged from the regimented structure and built-in brotherhood of the military, the vets seeking help at Operation Stand Down have struggled on and off, for years, or even decades, after leaving active duty. Through its programs, they are reconnected with a holistic support system that helps them make concrete changes and once again become healthy and self-sustaining. Part of the healing process happens in a nondescript back room at the agency’s headquarters, beyond a narrow maze of cubicle offices, where veterans gather for weekly Soul Care meetings. “There is a spiritual component to soldiers’ resiliency and we recognize that at Stand Down,” Deacon Krenson said. Operation Stand Down is a secular organization, but does offer opportunities for spiritual growth. “I am a soul and I have a body,” Soul Care leader and Vietnam veteran Larry Malone called out at a recent meeting. “I am a soul and I have a body,” the men repeated. After a series of call and response affirmations, the men quieted down and listened to Scripture passages and reflections chosen by Malone and his co-leader Terry Smith, a life coach and counselor. Acting with a lack of moral clarity amid the fog of war can cause a wound “that takes residence in your soul and makes you hopeless. … When utter hopelessness sets in, suicide looks good,” Malone said, in a tone that implies he knows exactly what he’s talking about. The spike in veterans’ suicides since 9/11, now surpassing combat deaths, is alarming to Malone, and he wants to do whatever he can to offer peace to vets struggling with suicidal thoughts or lack of identity and direction. Vietnam veteran Craig Bothwell, his arms covered in tattoos, including one that says “Fight or Die,” flipped through his Bible during the Soul Care meeting. Facing a third round of leukemia, Bothwell, who served in the Navy during the Vietnam War and is a participant in Operation Stand Down’s transitional housing program, finds solace in the Soul Care meetings. “I need reinforcement of this type of thing,” he said. The weekly meetings ended with participants, many of whom are Bothwell’s housemates, joining hands for a final prayer before going about their days. Among the men in the circle were Marine Corps veteran Tony Manderson and Navy veteran Mark Evans. While the organization has been around for 23 years, and has 39 full-time staff members, it is still not well known in the community. “Most people are surprised with how deep we are,” said Deacon Krenson. 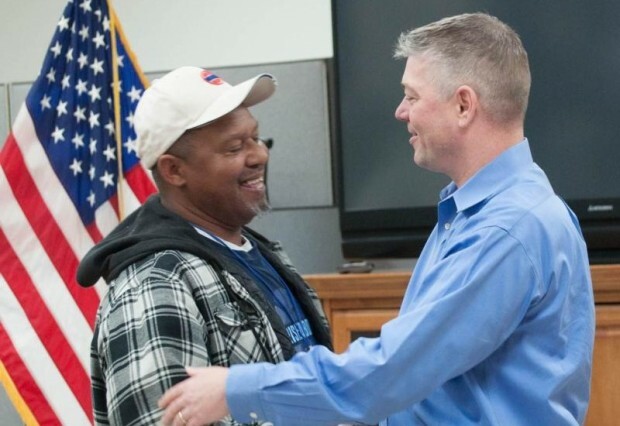 He was immediately identified as a good candidate for the transitional housing program, which provides housing and support for veterans while they regain control of their lives. He quickly moved into one of Stand Down’s seven transitional houses in Nashville. All 42 residents who live in one of the houses are given case management services and must follow a strict set of guidelines to stay in the house. “It’s important to have structure after being in the military all these years,” said Manderson, who enlisted after graduating from high school in Fayetteville during Operation Desert Storm, and saw combat in Iraq and Afghanistan. Transitional housing residents must attend weekly house meetings; actively look for employment; go to at least seven support group meetings a week; contribute to household expenses; complete daily chores; be home by curfew; and adhere to a zero-tolerance policy for alcohol, drugs and violence. The residents — a diverse group of veterans of different ages, races, religions, military branches and backgrounds — do have their squabbles and personality clashes, “but you work it out,” said Manderson, who was recently appointed assistant house manager. The house can even be an incubator for unlikely friendships. “There is camaraderie with other guys in the house,” he said. Manderson, who was raised Southern Baptist in rural Tennessee, and his roommate Mark Evans, an African-American who grew up in a Catholic family in the Chicago suburbs, have a bond cemented by their common background of military service. “Vets can relate to other vets,” Evans said. When Evans arrived at Operation Stand Down last spring, he was unemployed and living in his car. A member of a submarine fleet during the Cold War era, Evans was honorably discharged and went to college on the GI Bill, graduating in 1986. “That gave my mother bragging rights,” he said, being the first of his seven siblings to graduate college. Evans had steady employment until he suffered a brain aneurysm and a series of strokes. “I became ill and things spiraled down after that,” he said. He came to Nashville about a year ago to live with his brother, but when his brother had to move, Evans had nowhere else to go. He sought refuge at Matthew 25, a shelter that helps homeless men, especially veterans, get back on their feet. From there, he heard about Operation Stand Down, and got a spot in the agency’s transitional housing program. Laurence is a staff writer at the Tennessee Register, newspaper of the Diocese of Nashville.